Tangie is a citrusy burst of silly goodness. It’s a wildly popular strain for good reason – it helps you feel like you’ve got friends, like you’ve got this. I love its happy euphoria… a lot. I (vaguely) remember smoking some of this strain out of a glass blunt and sitting by Lake Merritt in Oakland, Cali. It happened to be 4/20 so naturally, everyone was smiling and soaking up the sunshine. People were passing out compliments and snacks. The vibe was perfect. I remember literally rolling down a grassy knoll giggling. It made me happy to be alive. Okay, have I sold you on this strain yet? Rove wasn’t a company I was initially familiar with. It’s a company that makes some noise about terpenes and their particular significance to the overall cannabis experience. However, the brand leaves me with a lot of questions. For instance, the website says Rove’s 100% organic cannabis is sourced from a collective of farms in their network, but (at the time of this review) they don’t offer any farm names or even location. In this adult rec moment in the cannabis industry, you can’t really get away with not telling me certain key pieces of information. Sourcing is a big part of building brand loyalty, and I’m not sure why Rove isn’t doing it. But let’s dive into the experience. Rove’s packaging is pretty slick, albeit teeny tiny. The cartridge’s black box is small, compact. The cart slides out in a foam cut-out. I’d be worried about damage in a big way with packaging this whimsical. Unfortunately, this product and carton are not well-labeled. Aside from the logo, which takes up a lot of real estate, there’s strain info and net weight on the bottom of the slide out foam. There’s no testing info, batch number, THC/CBD ration or Prop 64 and 65 warnings. As for the product itself, it fits the bill with 510-compatible threading and a sleek appearance with a black metal tip to match the box’s orange and black branding. I’m sure there’s a Marvel character out there who would be stoked for this particular style. The cartridge is not labeled with its strain. The cartridge’s taste matches most other Tangie strains I have tried but it wasn’t as distinct as I had hoped. There was a pleasant citrus “burst” that’s fun on the tongue, but could definitely be “more Tangie.” It felt a bit like Diet Coke of Tangie experiences. The vapor was kind of basic, to be honest. It was easy on the throat but also didn’t feel like I was “getting anything.” This feeling doesn’t create an optimal smoking experience. You want to feel the cloud leaving your body – that’s the part of the fun. This vape doesn’t leave any sort of coating in your mouth, which I like, except when we’re talking about certain strains. 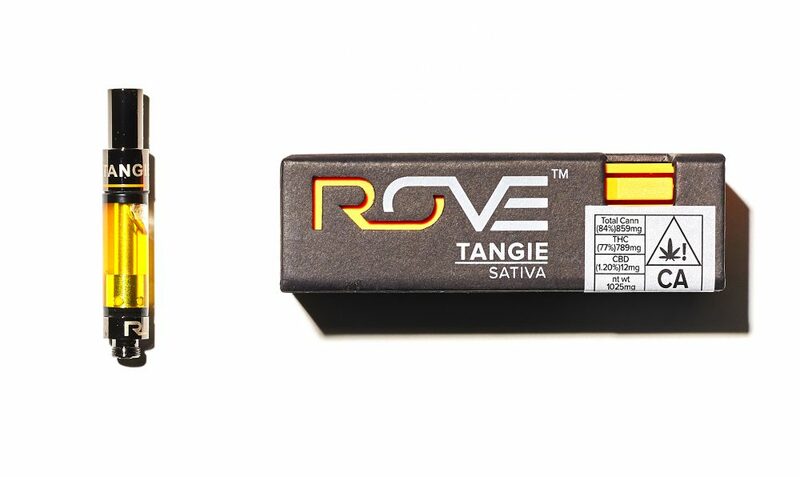 I want a tangerine-y aftertaste that Tangie is known for…and I just didn’t get it with Rove’s cart. I can see that oil is a nice gold color and it’s pretty chunky. Depending on how you have stored the cartridge, you may need to heat it up to loosen the oil and get it to vaporize. This is not an indicator of bad quality, but rather that Rove didn’t “cut” this product with other additives or oils to make the product thinner. It’s compatible with most vape batteries that are 510 threaded. Do try to pre-heat it however your battery can to break up some of this thick oil to avoid cracking or it popping back into your mouth. That’s never fun! After a couple of puffs of the Tangie, I slowly started to get a head high and uplifting effects that were perfect for my midday slump. While it doesn’t “taste” as strong as other carts can, the effects were moderate. Moderate, but felt. For a Tangie high, it seemed a little more chill as opposed to the usual energetic Tangie I know and love. Given that Rove’s Tangie was middle-of-the-road in terms of potency, I’d say it’ll work for people looking for something suitable. Like if you just want a cup of coffee or a run-of-the-mill vape, this will do the trick. It didn’t wow me, but it is still pleasant, don’t get me wrong. And it’s reasonably priced at $35 for a half a gram. This might be a determining factor for folks who know they want to try Tangie but don’t want to break the bank. It’s also possible that because the company didn’t go crazy on branding and packaging, they’re able to bring consumers a more affordable vaping option. I get that, and I get that this is a costly industry to get traction in right now. Minimalist can be good, but I also want to have faith that it can hold up. Packaging this flimsy risks damage to the product, which ultimately, isn’t great for a consumer who’s invested their hard-earned money and wants a product that’s going to last! Too sparse to be trustworthy. Basically just the logo, strain and type and size on the bottom of the slideout. No testing info, THC/CBD info or Prop 64/65 warnings. Composed of metal and glass, more durable than plastic and doesn’t clog easily. Becomes warm to the touch after a few longer consecutive draws. Offers a citrusy and sweet taste that’s reminiscent of the strain. Sort of like the Diet Coke of Tangie experiences. Smooth and enjoyable, easy on the throat. Not much of a cloud, lacked the thickness I was looking for. Didn’t leave any unwanted taste or feeling in my mouth. Gold, chunky and fairly thick. Consistency indicates this product is less likely to be “cut” with undesirable additives. May need to heat this cart up in order to loosen the oil and get it to vaporize. Effects were mild but did help lift me up from the mid-day slump. Seemed a bit more relaxes as opposed to the typical energetic effects of Tangie. Didn’t taste as strong as other carts I’ve tried. Simple to use with a 510 compatible battery. This sample worked consistently for me, though it was the first cart I’ve tried from this brand. Affordable pricing, which makes it good for someone who wants to try vaping a Tangie strain but doesn’t want to drop serious dough to do so. Rove’s Tangie cartridge is made of high-quality glass with a metal tip that doesn’t clog easily and offers a smooth vapor that’s easy on the throat and lungs. The taste is very similar to other Tangie strains, defined by a sweet and citrusy flavor. The effects were moderate and more relaxing than energetic. Higher-tolerance users, skip this one. However, for new cannabis users or consumers who want something mild, this cartridge is a good option for a mid-day pick-me-up. Just don’t expect too much information about the actual product. If you want to give Rove’s Tangie vape a try, visit Nugg Club and enter your address or browse the many other vape carts available.